GMCH Chandigarh Staff Nurse Recruitment-2018: Chandigarh Government Medical College and Hospital has been released a notification to recruit the various vacancies in GMCH departments. 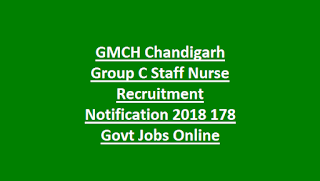 There are total 178 vacancies available in this current staff nurse recruitment of GMCH Chandigarh. Category wise staff nurse vacancies details are given below. Interested and eligibility criteria having candidates can submit their application form online on or before 25-10-2018 though official website of GMCH Chandigarh. For more details regarding GMCH Staff Nurse Jobs Recruitment Educational qualifications, age limits, selection process, how apply online and more details are given below. 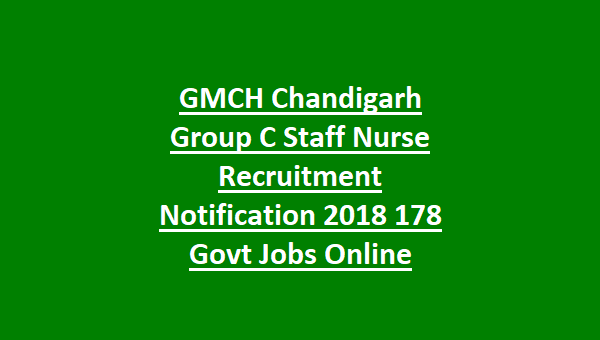 There are total 178 Staff Nurse vacancies available in GMCH Chandigarh. As on 01-01-2018 age limits are 18-37 years. For SC 5 years and for OBC 3 years of upper age relaxation is given. GNM Diploma or B.Sc Nursing qualified candidates are eligible to apply online for this GMCH vacancies. Selection for these paramedical posts will be held based on written test and merit in educational qualifications. There is no interview for this GMCH Chandigah Staff Nurse jobs. Written test will be conducted for 70 marks. Eligible candidates can apply online through GMCH official website @gmch.gov.in. Before applying online please check your educational qualifications and other eligibility condition in official notification.